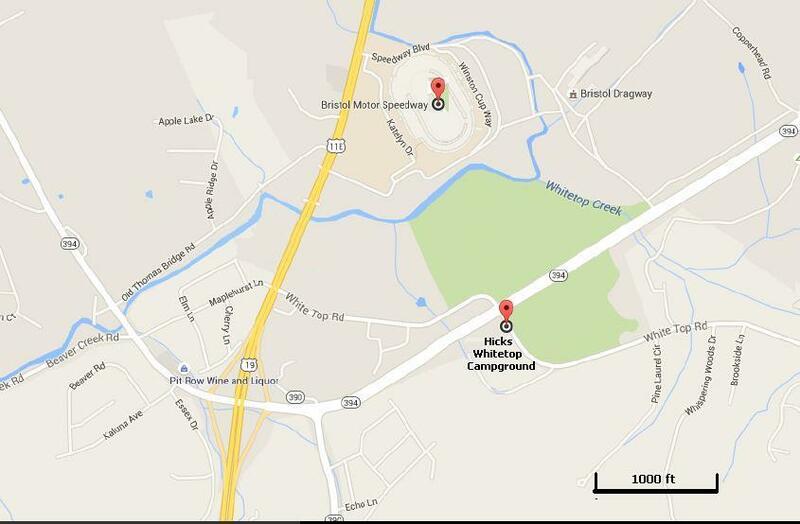 We Are Conveniently located within walking distance of 1/3mile to Bristol NASCAR speedway at the corner of Hwy 394 & White Top Rd. From the North : On Interstate 81, take Exit 69 ( Blountville Exit) to Hwy 394 Turn right onto White Top Rd. Then you will take a Right onto the first driveway which is the Main Entrance to Hicks White Top Camground. From the South : On Interstate 81, take Exit 69 ( Blountville Exit ) to Hwy 394 East. Turn right onto White Top Rd. Then you will take a Right onto the First Driveway which is the Main Entrance to Hicks White Top Campground. From Johnson City 11E : North to Hwy 394 East ( Blountville / Bluff City Exit ) Turn right onto White Top Rd.. Then you will take a right onto the first Driveway which is the main Entrance to HIcks White Top Campground.